Yves here. As Wolf alludes in this post, one of the reason so many real world retailers are hitting the wall so hard is that private equity leverage and asset stripping made them particularly vulnerable. While the losses to online retailers would have forced some downsizing regardless, the fact that so many are making desperate moves in parallel is in large measure due to the fact that the tender ministrations of their private equity overlords have made them fragile. Eileen Applebaum provided examples of how this worked (and regularly left bankruptcies in its wake) in an interview with Andrew Dittmer. Now here is the cute part. First, remember that the private equity fund manager makes out regardless of whether their investors do well, since nearly 2/3 of their total fees are not related to performance. We’ve posted on how private equity fund managers get rich on management fees alone. However, private equity fund managers do have an incentive not to burn private equity limited partners, since they want to raise more funds. The real estate asset stripping op co/prop co model is analogous to the discredited dividend recap strategy, which was widely criticized after Clayton & Dubilier quickly bankrupted Hertz that way. But leveraging up a company in a very big way and extracting a lot of cash, which the op co/prop co model does, allows the private equity fund manager to make a big distribution to investors early on, producing a handsome IRR on that deal. And if the deal goes bad, what happens? The end result to the private equity investors depends on how much cash was returned, between the real estate sale and any positive cash flows afterward, before the company goes bust. It could turn out to be pretty profitable to a bit of a turkey. The real losers are the lenders to the retailer. And who might they be? Increasingly they are the very same investors as in the private equity funds. Private equity fund managers offer credit funds, which lend in large measure to private equity deals. However, the effect for an investor like CalPERS is to distort which pocket made the money. The private equity deal looks better by virtue of dumping losses on the credit fund, which are seldom recouped even in case of seemingly obvious fraudulent conveyance (those cases are costly and difficult to win and even then, recoveries are almost always partial). So from the perspective of reporting investment strategy returns, the private equity gains are coming at least in part from bankruptcy-induced diminished returns at credit funds held by the same investors. This entry was posted in Credit markets, Economic fundamentals, Guest Post, Private equity, Real estate, Ridiculously obvious scams on April 25, 2017 by Yves Smith. That’s a new angle for evaluating amazon : it’s not that retailers are closing because amazon is expanding . Rather its seems that amazon is expanding Because retailers are closing. Bezos probably should thank PE firms for their destructive activities. Exactly. The crappified shopping experience and lack of inventory came first. A miserable brick and mortar experience drove shoppers into the welcoming arms of Amazon because they just wanted to buy stuff and retail made it hard. Whether it’s called “slim inventory” or “JIT”, it’s a problem for shoppers. I’m sure an old junk bond Wall Street dood like Bezos is already pals with ’em! Great article, and should be enlightening for those not in the know. Whether Josh Kosman’s outstanding book, The Buyout of America, or Eileen Appelbaum’s marvelous work, the PE swineherds have been dismantling the American (and other countries’) economy for quite a few years now, and the kings of debt, led by Peter G. Peterson who spends his free time decrying debt (?!?!?!? ), are the villains of our age! The retail market, by and large, is hosed, especially if they’ve decided to get into bed with PE. Amazon might be filling out the areas left bare by the collapse, but Amazon itself has a major problem in the form of counterfeit inventory which is going to blow up in its face. If you look at the comments on HN, more than a few people mention how they got something that was sold (sometimes by Amazon) as legit, but turned out to be fake – this stems from Amazon’s practice of commingling inventory when you participate in their “fulfilled by” program. Considering their expansion into grocery and other food-type items, a counterfeit scandal is one they can ill afford. If retail’s currently fried, and you can’t trust what you buy on Amazon, what’s left? The correction is going to take a while, and will be deeply felt, I fear. > If retail’s currently fried, and you can’t trust what you buy on Amazon, what’s left? Manufacturers cooperating or colluding to develop their own sales platform and cutting out Amazon and Wal Mart and selling direct to the customer. I do believe that alibaba.com and dealextreme.com has cornered that market opportunity already. These days you can buy an insurance for your shipment so if your package is nailed by customs they will send another one until one finally makes it. I buy components that way, one can buy hundreds-off components at the 2-5k price levels offered by f.ex. digikey.com. Exotic stuff too. The reason to still use Digikey & co are mainly for traceability, assured quality, genuineness and convenient re-ordering but for personal use … it doesn’t matter so much. You won’t be surprised to hear about this scam operating in the UK. It has been the case for about thirty years and forms part of the “financial engineering” that has replaced metal bashing in Blighty. It’s not just retail, but football (aka soccer) that has fallen victim. Many clubs were similarly divided between the operating company / team and the ground. Some still are, e.g. Chelsea and Stamford Bridge. Around the turn of the century, a former footballer (ex West Ham and Manchester City and one of the mobile chicanes negotiated by Diego Maradona for his second goal against England at the World Cup in 1986) who had made a small fortune at the Lloyd’s insurance market, approached my employer, HSBC, for a loan, if not a partnership, to take over Aston Villa, which operates from a big site in Birmingham (Villa Park). His plan was to split the football club from the ground / stadium and get the club to pay the landlord rent, develop the ground for residential and retail purposes, and get the club to share a stadium with another Birmingham / Midlands region club, e.g. Birmingham City, Wolverhampton Wanderers (Wolves) or Port Vale. HSBC wisely declined. It was still just about a boring trade bank then, but was embarking on a spree under John Bond. Not long after, Barclays (a future employer at the time) became adviser to Leeds United. I don’t know if Leeds split between club and ground (Elland Road), but the club began leasing, not buying players, and securitising the income stream. After some success, including an appearance in Europe’s top competition, Leeds fell apart and is languishing in the lower divisions (minor leagues). Philip Augar, a former banker (Schroeders, NatWest etc.) and author (Reckless Capitalism, Decline Of Gentlemanly Capitalism etc. ), dedicated one of his books to Leeds United, his childhood club, “one of the early victims of this madness”. The footballer I mentioned above is still active in the City, not so much at Lloyd’s (opposite one of my two offices), but with financial engineering in sport. He was widely quoted in the FT a few weeks ago. With regard to retail, the scam played a part in the collapse of a retail chain, British Home Stores. The former chairman and main shareholder, “Sir” Philip Green, split the retail operations from the stores. He / his Monaco company owns many of the (former) sites, including what was BHS HQ in Marylebone (just down the road from Baker Street station and Mme Tussaud). I forgot to add that said player was still hawking the same “financial solutions” (snake oil) in the FT. The paper did not mention how the solutions had worked out. The thing is, in many cases, the solutions seem / are designed to fail, after some roaring success, and (or so) the insiders can profit from the wreckage (“disaster capitalism”) as they are often creditors (e.g. the knight of the realm above) and can salvage what they consider to be the valuable bits. Just one more thing to add, sorry, is that many UK retailers are under similar pressure. One hears in the City that one or two household names are nearing collapse. One well known US Main Street store merged with a well known and similar UK High Street store a couple or so years ago. They are run / owned from Switzerland, I think, by an Italian, whose PE firm, again based off shore, is one of the biggest shareholders in the group. The Italian billionaire ran the UK firm before the merger. They are rumoured to be one, if not the, next domino. Yet another unintended (?) consequence of QE ∞. enabled PE firms to raise large amounts of money at low rates. letting the market work its magic and protecting us from the dead hand of state intervention. And the great recession meant that there were plenty of stressed business which PE funds could gain controlling interests in for relatively low cost. ZIRP also made it easier to load all of these retailers up with excess debt. Management could borrow more money than necessary, pay themselves lavish bonuses with the excess, and claim that “interest rates are low; making payments will be easy“. They could even show you the math. Of course, that math assumed that sales would steadily climb into the future. If sales fell even slightly, the payments became an oversized burden. And paying off the enormous loan principal was beyond all hope. Companies with little debt can generally survive a reduction in sales. They can engage in cost-cutting exercises, maybe encourage some employees to retire earlier, etc. It’s even easier if they own their own property and don’t have to renegotiate a lease. But when you’ve got a lot of debt and servicing that debt requires that sales continue to rise quarter after quarter after quarter without fail, then things get a LOT more fragile. The effects of even a single bad quarter get greatly amplified. [“Leverage” can work both ways.] And steadily-declining sales are the kiss of death. Oh, yes. Ultra-low interest rates “helped” retailers a lot. Helped set them up for failure, that is. Most retail jobs are already part time and now 2017-18 looks to be the death of retail altogether. Which sector is absorbing these legions of workers? It’s certainly not manufacturing and I’m fairly certain 60,000 new Uber drivers didn’t hit the streets. I dunno but seems like every time I turn around I discover someone else I know who’s driving for Uber and/or Lyft. All age groups. All struggling to survive. The demise of retail is especially chilling as it used to be a sort of fall-back job. Not no more. Where’s all the zillions of jawbs Trump is going to magically provide?? Maybe Trump’s claiming responsibility for creating 500,000 new Uber and Lyft jawbs? Guess a huge component of Boeing workers are about to become Uber drivers in Seattle in May. Woo hoo! Technology is doing its best to hide the misery of the 99%…temporarily. That’s a good one (LFMAO)! I know some firm bought Friendlys the ice cream/restaurant took the ice cream in a box business and split it off then left the restaurant part to die. It was American businesses​ best friend Sun Capital. Interestingly, it seems to me, that the off shoring of clothing manufacturing to China, and the subsequent fall in inventory cost to retailers and the incredible margins they operate on hasn’t done anyone any good in the end. I have found retail shopping over the last ten years to be a poor now bordering on depressing experience. Poor selection, sparse stores, uncompetitive prices,staff either untrained or trained only to nag about loyalty cards, and the quality of items has nosedived across the board. Even the “luxury” items are cheap and poorly made. The only consistent exvception to this trend is toy stores. I guess kids are tougher customers. I hate shopping online. I hate the uncertainty. I hate the delay. I hate the decision fatigue. But what choice do I even have anymore? It costs me more petrol to go shopping than they charge for delivery. Thanks, FedUpPleb — I keep telling this to the stooges who keep prattling on about the low cost of items — which are far too expensive, last only several washings (delicate cycle only, of course) or several months and are of the poorest quality, completely different from my youth! What with all of the closures, there might be opportunities for the retailers that survive if they avoid the mistakes of their fallen competitors. But are there any examples of companies out there that are doing these things? Nordstrom? Costco? Anybody? There retailers are national chain retailers. Before them, there were mom-and-pop retailers. They had bleak-future-moment a long, long time ago. Perhaps they will come back one day, when people make enough money to value service again, instead of supporting ‘trade’ as a WSJ poll shows, because trade means affordable junk commensurate with stagnant or declining real wages. I stopped buying clothes at brick and mortar stores starting around a decade ago because of crapification. If you need tall sizes for shirts, you used to be able to get these at most every department store, but over the last decade or two almost every department store around these parts was sold and restructured; after these changes the stores always have less inventory for higher prices. Now the only place you can find a wide selection of tall sizes is the internet. Retail clothiers have essentially said we’re not interested in selling things to tall men. And they’re not interested in selling things to large men, or large women, or short people, or old people. How badly should I feel about the disappearance of an industry that decided they had no interest in me whatsoever? Asians, Hispanics and teenagers are a more important market to them than tall white and black men. Just curious. 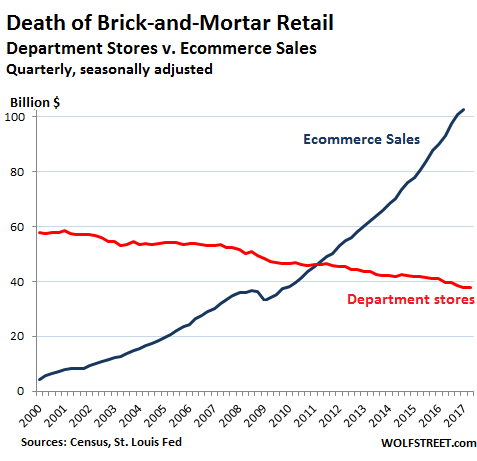 First they killed off family farms; then mom and pop stores; then they wiped out mainstreet; now they are busy demolishing brick and mortar malls. What comes next? It looks like PE might be killing itself. In destroying malls they are also distroying a class of investor who wanted the income based on that capital. Not all of them. Looks like ours might, though. Is the big leveraged buyout wave of 2005-2007 about to claim another victim? … in 2007, the company was taken private by Mitt Romney’s former private-equity firm Bain Capital in an LBO valued at $2.1 billion that left it saddled with $1.6 billion of high-yield debt. Coming just ahead of the 2008 financial crisis, the company struggled with its high interest payments for several years. As Mitt would say, why don’t they get a loan from their parents? I used to enjoy Garland’s writing about Guitar Center. Too bad he embarrassed himself and became the epitome of the deluded Clintonite liberal with his “Time for some game theory” tweetstorm. Who was the smarter private equity kid in the room – Bain or Ares? Ares had a deal down in West Texas with Clayton Williams Energy Inc. (You remember Clayton – he ran for Governor of Texas against Ann Richards) Unfortunately Clayton decided not to hedge his production for 2015-6, just before the Saudis pulled the plug on the oil price in November 2014. All of a sudden CWEI, whose share price had been bouncing around above $100, was two jumps ahead of the sheriff with bankruptcy a real threat. The stock got down to 7. Beginning last March Ares put in a bunch of equity and debt, and it turned out Clayton had squirreled away a ton of acres in the best part of the Permian Basin. With BK off the table the stock price recovered, Noble Energy bought them out for $130+ per share, and Ares made about six times their money in less than a year. What’s interesting for present purposes is there was no asset-stripping or any other shenanigans. Ares took a risk – which looked huge at the time – and made out like bandits. That’s how it’s supposed to work. And the funny thing is, Ares is owned by a bunch of Arabs out in the Middle East. Great piece by Richter and Yves – and a lot of smart commentary from out here in the bleachers. Thanks to all. I buy about 50% my stuff on line and stores that have figured out to make themselves web friendly are best buy, home depot, osh, and then some manufacture like Haynes underwear have friendly sites. These 3 box stores site went from impossible to use to very friendly to use and shipping is normally free over small amount. I had to buy a new blue tooth the other day and amazon wanted $170.00 I then went to the company site and it’s very much improved bought recondition one for $39.00 free shipping. The new one there was $69.00 they have a third party sell through their site. Very interesting. Could Amazon suffer the fate that people go there to browse what’s available but then buy online direct from the maker’s site ? As you remarked many of the manufacturers’ sites have vastly improved as well as their access to fast shipping channels. This is already a known defense against the proliferation of counterfeit goods on generic online sites like Amazon that really don’t give a f**k about the fakes problem as long as they get their cut of the price. Big box retailers appear to be the ” canary in the coal mine ” !! I am a sales rep who sells retailers, both big and small. My accounts are struggling to stay even. No one mentions Amazon as competition, but it is a huge factor. 2. Anyone younger than 35 just doesn’t buy or even want to accumulate stuff. They just want wifi and to play with their phones. I wanted everything when I was young and for the most part, still do. 3. The economy. 2% GDP isn’t exactly blazing. So they flip it at an inflated value to another PE buyer to keep portfolio performances looking good and churn regularly until a secondary-fund picks it up to forward to a Liquidation Front Company. It is exactly what Philip Green did at BHS having stripped a £1 billion dividend courtesy of HBOS corruption. This game was well exposed under Robert Campeau decades ago. It is amazing how the old shell games continue. Same story at Karstadt in Germany with Thomas Middlehof and the Arcandor disaster. This site publishes Wolf Richter? Amazing. Yves: who will you line up with next? George Soros? Bill Nye? This site is definitely fake news. Terrible. My health insurance just went up $225/MO. My wife had a CT Scan that the national average is $1200. She was charged $3700. Care to guess who has cut back on retail spending. ?